This review contains minor spoilers regarding Captain Marvel plot details. With the recent success of DC Comics’ Wonder Woman in 2017, it’s no surprise Marvel would quickly follow suit and try their own hand at a female led superhero film with the recent Captain Marvel. Directed by Anna Boden and Ryan Fleck, with Brie Larson in the title role. The film can be enjoyable but it’s ultimately weaker than most of the other origin films of other famous Marvel characters. The story of Captain Marvel is about a woman named Carol Danvers, an Air Force pilot who has lost her memory and spent the last few years living as a solider among human-like aliens known as the Kree. She believes she is one of them as she shares similar powers to them, though she is reprimanded often for her impulsive nature fuelled by emotions, which can dangerously overcharge her powers. Carol begins having these dreams about her life living on earth, and after a scuffle with the Kree’s mortal enemies, a race of shape-shifting aliens called the Skrulls, Carol finds herself heading to Earth and teaming up with MCU veteran Samuel L. Jackson’s Nick Fury on a quest for the truth. The story beats follow a similar pattern as the previous films have established. A hero that yearns for more, a villain that’s revealed to be closer to them than they expected, a few quips to lighten the mood, and the ever shadowy S.H.I.E.L.D. organization is somehow involved in all this. This isn’t necessarily a bad thing, but the main issue with the story is how it’s set up. The story takes place in the ’90s, which makes this a prequel to most MCU films. This means a lot that happens here doesn’t have much consequence in the bigger picture that the Marvel films are trying to tell. 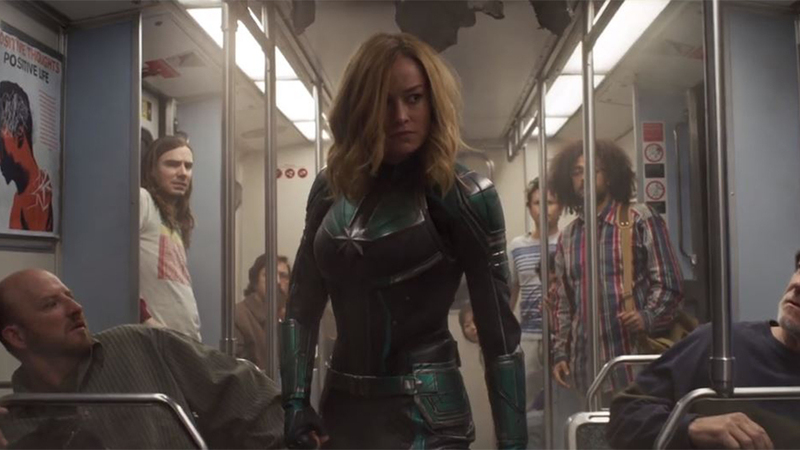 Brie Larson as Captain Marvel on her hunt for a shape-shifting Skrull on a moving train. (Photos property of Marvel Entertainment and Marvel Comics). Until this film, Captain Marvel or her exploits in this movie aren’t mentioned by Nick Fury, or anyone else in any other film. If she was so important, why wasn’t she called in during the alien invasion during the first major Avengers film in 2012? This film tries to hammer in the fact that she’s one of the most powerful heroes, yet she can’t bother to return from space until after half the universe has been wiped out. This film proves why it’s dangerous to write a prequel film, because if done incorrectly, it ends up retroactively creating plot holes in the ongoing story. Also, the film having constant ’90s references such as Blockbuster, Radio Shack, Windows ’95 computers, and so on, become eye-rolling after a while. The characters themselves vary in likeability. Larson does an alright job as Carol Danvers, however she is also equally unlikeable in a few different ways. The biggest gripe with her performance is the character has a reputation of letting her emotions overtake her, as established early in the film, but about 85 per cent of the time she’s on screen, she fails to properly convey the right emotions in her acting. Her Carol Danvers is a far cry from the walking charisma factory that is Robert Downey Jr.’s Tony Stark, or even Chris Pratt’s Star-Lord. Fortunately, the supporting cast more than makes up for it by having actual emotions. Jackson as Nick Fury is always a delight in these films and having him essentially be the secondary protagonist ends up being a treat. His sharp wits and even sharper tongue made any scene with him worth paying attention to. The same can’t be said for the Skrull leader, Talos, however, played by Ben Mendelsohn. A Marvel film having snappy dialogue isn’t anything new, but it feels overboard at times with Talos’ dialogue, almost as if they forgot a villain has to be somewhat threatening. Carol Danvers and Nick Fury discussing their plans to find out more info. The film’s visuals are by the numbers at this point in the Marvel franchise; its strongest aspect is the set design, with sprawling cityscapes and unfamiliar and almost trippy alien home worlds acting as backdrops for most the film. That doesn’t go for every visual aspect, however, as costume design is severely lacking this time around, and it’s most noticeable with Danvers’ bland hero costume that looks more like a paintball outfit than something an alien soldier wears on duty. The CG fight scenes also vary in quality, with one near the end looking wonky at certain points and even hard to follow, with so much clutter and explosions everywhere. The best-looking scene was a dog fight between spaceships in the middle of a desert canyon. Funnily enough, that scene doesn’t even look like it’s from a superhero film if isolated, as it doesn’t even show off Carol’s powers at all. The soundtrack is the weakest part of the film, as most of its original score was forgotten as fast as it came, with the only saving grace was the use of classic ’90s artists sprinkled in occasionally for a similar Guardians of the Galaxy effect, though not as impactful as music doesn’t come into play narratively, unlike Guardians. With such bands like Nirvana, R.E.M., and Garbage, the licensed songs, while good, add to that occasionally obnoxious “this film takes place in the ’90s!” message I mentioned earlier. If you’re a Marvel fan, you’ve probably already seen this movie and are excited to see the next installment of the franchise: Avengers: Endgame. However, if you’re a casual movie-goer, Captain Marvel isn’t a must see, as it’s not as strong as other origin films in the franchise like Iron Man, Captain America: The First Avenger, or Thor. The movie isn’t unwatchable by any means, but a lot of it feels like a corporate manufactured “safe” Marvel flick that’s guaranteed to make money no matter what anyone says.